Hey everyone, today we’re going to be taking a look at some of the best Ben Sherman watches available for under £50. So if you’re looking for some that’s affordable yet still stylish, I recommend taking a look at the watches we’ve featured today. 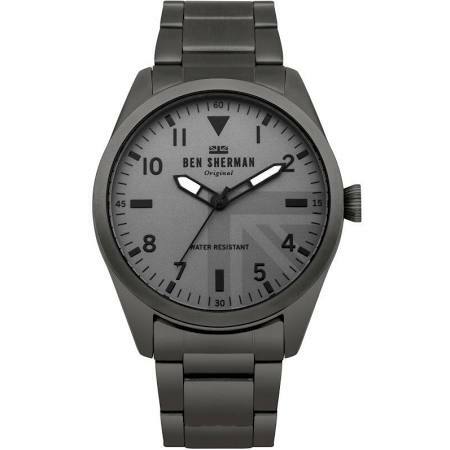 Ben Sherman watches offers a large range of styles and designs at an often very affordable price point. They tend to feature quartz movements and basic water resistance ratings. We like to keep our lists up to date so we will reguarly be adding new watches and removing old ones from this list. If you have any comments about new models we should add in, be sure to let us know in the comments section at the end. For now, enjoy our top 5 best Ben Sherman watches under £50. First up in today’s list of the best cheap Ben Sherman watches is the Ben Sherman BS151. This men’s watch is built with a stainless steel casing that has a diameter of 38mm with a thickness of just 10mm. It features a PU strap with a width of 20mm and fastens with a buckle style clasp. 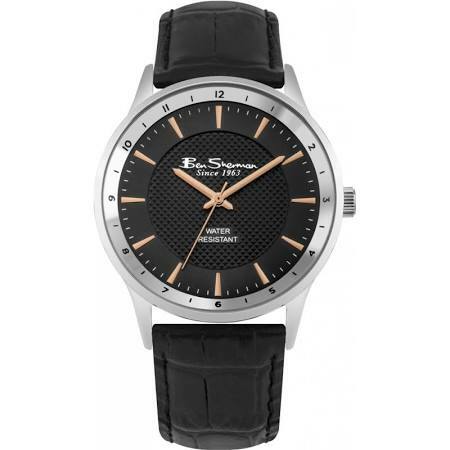 This is your classic choice when searching for cheap Ben Sherman watches for men. Up next in today’s list of the best Ben Sherman watches is this stunning affordable quartz timepiece. 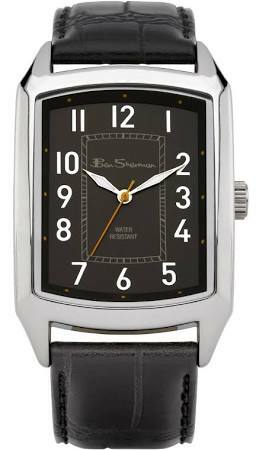 This Ben Sherman watch is built with a stainless steel casing that has a diameter of 38mm with a thickness of just 8mm. The strap is made of PU with a width of 20mm, this fastens with a standard buckle style clasp. I love the textured dial and the rose gold tone hands and hour markers, they really make this watch look high end. A protective mineral crystal glass lens provides scratch and shatter resistance. The watch is powered by an accurate and reliable quartz movement. It also has a basic 10m water resistance rating. If you love military watches with that pilot style dial design then this Ben Sherman affordable watch could be just what you’re after. It’s built with a gunmetal coloured stainless steel casing that has a diameter of 38mm with a thickness of just 10mm. The strap is also made of stainless steel and fastens with a standard fold over clasp. The dial features these large bold hands that stand out against the grey coloured background. Powering this affordable Ben Sherman watch is a reliable and accurate quartz movement. A mineral crystal glass lens protects the front of the watch. It also comes with a basic 30m water resistance rating. 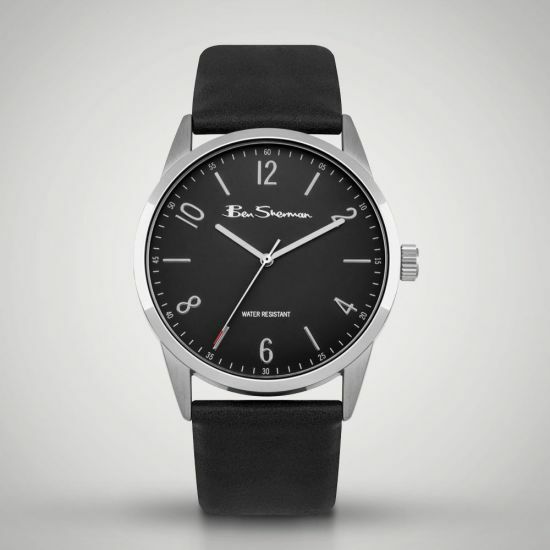 In at number 4 for our best affordable Ben Sherman watches is the BS027. This is a men’s rectangular watch that’s proven very popular with lots of highly rated reviews. It’s built with a stainless steel casing and comes with a PU strap that fastens with a buckle clasp. A quartz movement provides this watch with accurate and reliable timekeeping. Like the previous Ben Sherman watches, this model also features mineral crystal glass for added resistance against scratches and shattering. The water resistance rating of this model is 30m. Last up in today’s list of the Best Ben Sherman watches under £50 is this awesome Ben Sherman chronograph watch. This is a large stainless steel watch with a diameter of 42mm and a thickness of 10mm. The strap is also made of stainless steel and fastens with a fold-over push-button clasp. I really like the large clear display on this timepiece, the hands stand out very well against the black background of the dial. There’s also a 3 chronograph subdials on display as well as a tachymeter around the outer ring of the dial. Powering this Ben Sherman watch is a reliable and accurate quartz chronograph movement. A mineral crystal glass lens helps to protect the front of the watch from scratches and shattering. 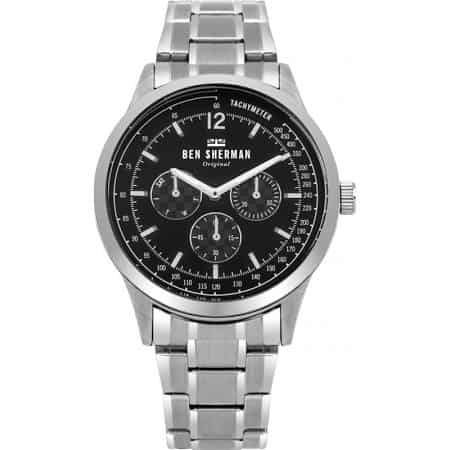 This Ben Sherman chronograph watch also has the added benefit of a 50m water resistance rating. What was your favourite Ben Sherman watch from today’s list? As always we’d love to hear your opinion on the matter so comment below and let us know.